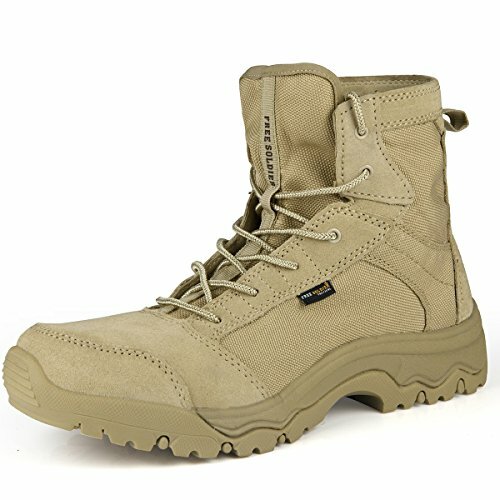 FREE SOLDIER tactical boots with 100% Quality Guaranteed! 1. Lightweight breathable combat boots, suitable for hot weather travel, highly breathable, keeping feet cool and comfortable at all time, so that outdoor travel become easier, allowing you to enjoy a comfortable journey easily. 2. High quality leather, thick texture, more tenacious, not easy to crack, provides excellent durability, persistence, flexibility and permeability, also has good heat dissipation and wicking capabilities, and more resistance to sunlight and high temperature damage, making it the ideal summer footwear. 3.Abrasion rubber outsole is extremely slip resistance, minimize the possibility of fatigue and injury. This summer, you worth owning a good Tactical Boots. If you have any questions about this product by FREE SOLDIER, contact us by completing and submitting the form below. If you are looking for a specif part number, please include it with your message.